Three ministers were asked about their share-holdings during a press conference today. Finance and Public Expenditure Minister Paschal Donohoe with Junior Finance Minister Michael D'Arcy. FINANCE AND PUBLIC Expenditure Minister Paschal Donohoe was asked this week if he plans to sell his shares in Diageo because he now has control over excise in October’s Budget. In 2015, The Irish Times reported that Donohoe, who was then the Minister for Sport, had absented himself from all decisions relating to a Bill dealing with the issue of alcohol sponsorship of sports because he holds shares in drinks company. The declaration of his shares can be seen here in the Standards in Public Office Commission (Sipo) Member’s Declarations. 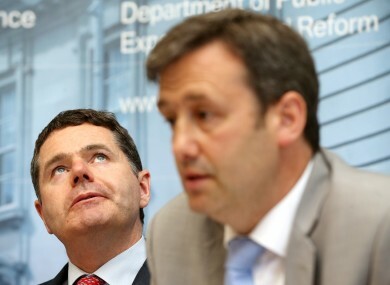 During a press conference on the Summer Economic Statement, Donohoe and his two junior ministers, Patrick O’Donovan and Michael D’Arcy, all acknowledged they hold shares. “There’s nothing that I have ever done in my career that I have been privileged to have as a public representative and a Cabinet minister that has focused on what my private interests are. “My guiding principle is in the public’s interest and that was the case when I had to make decisions in relation to how we invested in transport and tourism when I was Minister for Public Expenditure and that will continue to be the case,” said Donohoe. The only principle I have is the public’s interest and affairs in relation to myself or my family will never, ever interfere with that. These are matters and discussions I will have within my family and so on across the year. The reason I am declaring everything I do is because I am compliant with Sipo. I make everything publicly available. He added that all shares were obtained prior to him entering politics. As well as Diageo, the minister also holds shares in Procter & Gamble. O’Donovan and D’Arcy were also asked about the shares they hold. “I suppose Paschal better declare that he takes an interest in taking a drink every now and again as well while you’re at,” replied O’Donovan, who has shareholdings in Procter & Gamble, Vodafone and shares in an Ark Life pension. “I worked for Proctor and Gamble, I eat Pringles and I use Gillette, so I suppose that’s my interests declared. And I do have shares,” he answered, adding that he would not be selling them. “I do have shares,” said D’Arcy, adding: “I will be holding onto my shares. I have had them since before I went into politics.” Sipo records show D’Arcy holds shares in Glanbia. Email “Donohoe defends his share-holdings in drinks company Diageo”. Feedback on “Donohoe defends his share-holdings in drinks company Diageo”.